Investment in addressing structural stigma and discrimination against refugees in resource-poor urban areas is both needed, and possible. The large population of refugees residing in resource-poor urban areas is likely to grow, and tensions in a number of settings are now documented. Without interventions to adequately address such tensions, both the protection needs of refugee populations and the stability of hosting countries could be affected. 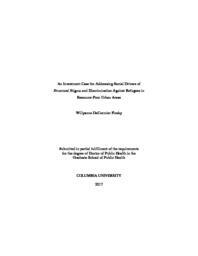 Through qualitative analysis of an urban refugee dataset in Uganda, this dissertation identified community-level drivers of structural stigma and discrimination as safeguarding one’s body and property, defending status, and perpetuating exploitation. The designs of potentially successful programs to address these drivers were then identified though systematic review, and included one or more of the following: 1) the utilization of multiple intervention components; 2) direct information provision (e.g., lecture, role-play, other active engagement) or direct contact with stigmatized groups; 3) cooperative work between community members and stigmatized groups to better livelihoods; 4) popular opinion leaders who have authority to make change, and 5) traditional ceremonies valued by the communities for cleansing and healing. One such design involving an agricultural livelihood program in a resource-poor urban area of the Northeast United States was costed, utilizing a primarily bottom-up approach and a societal perspective in the collection of both financial and economic costs. The unit cost per participating family was significantly lower than government services that provide comparable nutritional support, but did not include components of working with the community to reduce stigma and discrimination. Thus, the studied program provided more services for a lower cost. In addition, it empowered stigmatized refugees to advocate for and support themselves, and engendered goodwill in the community by involving community members to work alongside refugee participants, improving upon a neglected piece of land, and providing fresh produce. Further research is needed to better measure the social and financial dividends of programs to address structural stigma and discrimination, particularly against urban refugees. Such research can only come in tandem with further investment, the imperative and potential of which are compellingly clear.